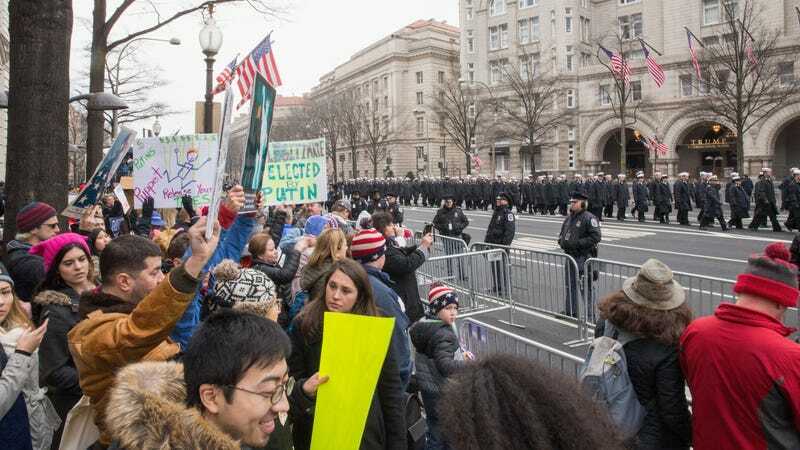 The Justice Department has obtained three warrants to search the Facebook accounts of people associated with protests of Donald Trump’s inauguration and an anti-Trump Facebook page they used to organize the demonstrations. In addition to private lists of people who planned to attend Facebook events created by the page, the searches would include the names of an estimated 6,000 people who simply “liked” it during a three-month period covered by the warrant. The Department of Justice (DOJ) served Facebook the warrants in February, along with a gag order that prevented the company from telling the activists they were being targeted for searches. But the department dropped the order earlier this month. One of the warrants was issued for the disruptj20 Facebook page, which was used as a forum for planning Inauguration Day protests. If Facebook complies with the DOJ, then the company would likely have to give lawyers the names of the thousands of people who “simply liked, followed, reacted to, commented on, or otherwise engaged with the content on the Facebook page,” according to the ACLU. The news was first reported by Law Newz and confirmed by CNN, which obtained court documents. The ACLU, which is is representing the activists, is fighting the warrants on the grounds that they hinder First Amendment free speech and violate the Fourth Amendment because of how broad the searches are. “What is particularly chilling about these warrants is that anti-administration political activists are going to have their political associations and views scrutinized by the very administration they are protesting,” ACLU attorney Scott Michelman told CNN. Last month, DreamHost said it would not comply with a request from the DOJ to obtain “all information available” of the website disruptj20.org, because the broad warrant could reveal 1.3 million IP addresses that visited the site and could identify people who were involved in peaceful political speech. A week later, the DOJ rescinded its request for the IP logs. The ACLU says that all previous court filings other than warrants (including any response from Facebook) remain under seal. Facebook did not immediately respond to a request for comment on how they are handling these search warrants. We successfully fought in court to be able to notify the three people whose broad account information was requested by the government. We are grateful to the companies and civil society organizations that supported us in arguing for people’s ability to learn about and challenge overly broad search warrants.